Dennaton Games hopes it can "fix" a scene of implied sexual assault in Hotline Miami 2, saying that it actually has meaning to the two characters it involves. 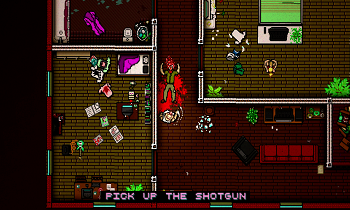 The demo for the upcoming Hotline Miami 2 drew considerable criticism back in August for its inclusion of a scene in which the player's character pins down a female NPC and then drops his pants. It's quickly revealed that the whole thing is part of an in-game movie, but the segment nonetheless left a lot of players feeling very uncomfortable, to the point that the developers have cut it from the demo completely and are now trying to rework it. "We were really sad that some people were so affected by it, because maybe they had been through something like that of their own. Maybe they had a terrible experience of their own that was triggered by the game. That was not intentional at all," Dennaton's Dennis Wedin told Rock, Paper, Shotgun. "We didn't add the scene just to be controversial. There is a meaning to these two characters. There's a lot more to them than just this scene." But while the scene has been removed from the demo, Wedin suggested that it could reappear in the full game. "We're going to work with it, see if we can fix it," he said. "You get a bigger picture when you play the whole game, which is lost in the demo of course." Wedin also said that players will learn more about the characters involved in the scene as the game progresses and noted that there will actually be a number of playable female characters in the full release.